Home / News / Latest News / Try Hockey For Free! TRY HOCKEY FOR FREE! Next Session will be February 23rd! The Mullett Ice Center will offer "Try Hockey For Free" twice a year! Try Hockey For Free is a great opportunity for your son or daughter to try the sport of hockey. The event is sponsored by USA Hockey and is completely free! All you need to do is register on-line at the link below. To register on-line, click the link below. It will take you to the Try Hockey For Free web page and all you have to do is find the Mullett Ice Center in participating rinks. Type in your zip code, click on the Mullett Ice Center icon (locate just above Hartland) and then register! Please note that we will have a limited amount of Helmets, skates, sticks and skates. If you have a bike helmet and winter gloves that would also be acceptable. If you don't have any protective equipment, you can use knee pads and elbow pads or any nature. Wearing snow pants is also a good idea. This free program is geared toward boys and girls ages 4 to 8. 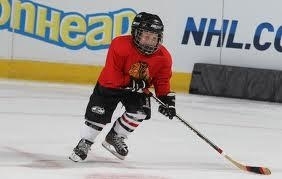 Go to www.tryhockeyforfree.com to register at the Mullett Ice Center. Check out our Facebook page for photos of our last event.